Air Pegasus (ICAO: PPL, IATA: OP) is the newest airline in the Indian airspace, and the second active airline to be headquartered in of Bangalore, after AirAsia India. The airline is a regional scheduled operator, and plans to fly a fleet of only ATR 72 aircraft. The airline received its first ATR 72-500 on September 27th, 2014. The aircraft, with a serial number MSN 699, formerly flew for the now defunt Kingfisher airlines as VT-KAA. The aircraft, back in India to fly for Air Pegasus, is registered VT-APA. Six months after receiving its first and only aircraft, Air Pegasus was granted its Air Operator’s Permit (AOP) by the DGCA. The airline officially ‘launched’ on April 1st, and today – April 4th 2015 – has opened for bookings. The second aircraft, another ex-Kingfisher ATR 72, is expected by the end of April 2015. The airline plans a third ATR 72 this year, details of which are not available. The airline is India’s first all-ATR72 operator. The airline plans to start operations on 12th April, 2015, with the inaugural flight from Bangalore to Hubli and back. The next day, the Bangalore – Trivandrum – Bangalore route will be inaugurated. These two stations are expected to be followed by Kochi, Chennai, Tuticorin, Belgaum, Rajmundry, Pondicherry and Madurai. Some of these stations witness good demand. However, it must be remembered that demand is a function of pricing. Average turnaround time at the airline is 25 minutes, and the total aircraft utilization with these two sectors is 5:30 hrs. We expect the utilization to touch close to 10 hours per aircraft per day. The airline opened for sales today, 4th April, 2015. The open for sales could perhaps have been supported by the presence of newspaper advertisements, media reports, tweets on the official Twitter account, or posts on the Facebook page. These were missing perhaps missing due to the long holiday weekend. It is learnt that the airline will launch a media campaign very soon. Online Travel Agencies (OTA) are yet to list the airline in their searches, and may soon happen. On the Bangalore- Hubli sector, a fully loaded ATR72 will consume around 875 litres of ATF as trip fuel, assuming a cruise at FL220. This translates to around INR 38,000 as fuel cost, including the discounted sales tax of 4% applicable to aircraft with less than 80 seats flying for a regional airline. The estimated operating cost, taking into account the low aircraft utilisation and few other factors, is at around INR 1,80,000 per flight, bringing the cost per seat on this sector to around INR 2,200, and CASK to INR 5.62. On the Bangalore- Trivandrum sector, a fully loaded ATR72 will consume around 1,125 litres of ATF as trip fuel, assuming a cruise at FL220. This translates to around INR 49,000 as fuel cost. The operating cost is estimated at around INR 2,00,000 per flight, bringing the cost per seat on this sector to around INR 3,000, and CASK to INR 5.45. Depending on the way revenue management at the airline is played with, the airline may comfortably break even with load factors of 70% +/- 10%. However, a lot of this depends on the actual demand by last minute travellers, when ticket prices usually sit in the higher buckets. This high yield D0-D7 demand is also driven by the service reputation that the airline builds over time. The airline enjoys a monopoly on the Bangalore- Hubli route, and this will do the airline good. 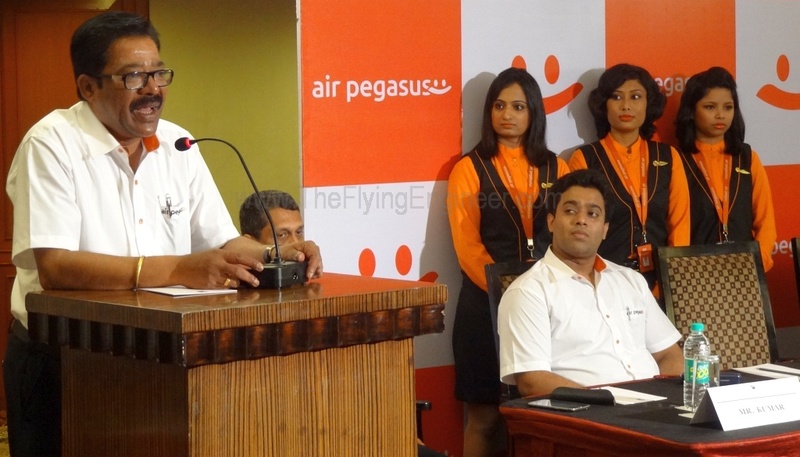 Air Pegasus competes with IndiGo, Air India, and Jet Airways on the Bangalore – Trivandrum sector. The airline will face certain stiff competition from IndiGo which prices its fares as low as INR 1,964. We wish the airline all the very best in its operations. SpiceJet’s Boeing 737-800 MSN 37366 earlier registered as VT-SGU had entered storage in the July of 2014. The aircraft, leased from BBAM, was recently painted in the colors of Pegasus Airlines, and will soon be flown off from Hyderabad Shamshabad to operate for the Turkish airline. 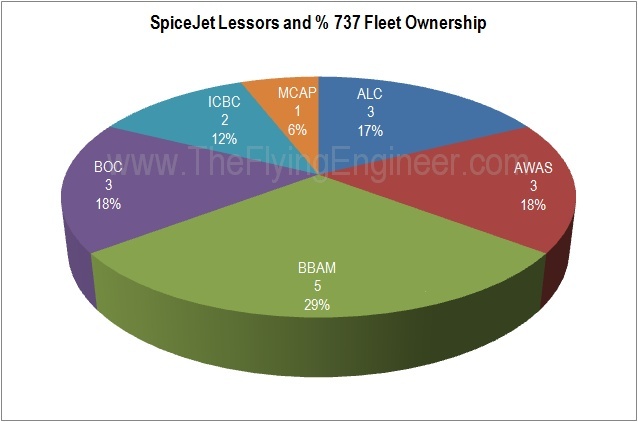 A very significant number of SpiceJet’s Boeing 737s were leased from BBAM, most of which have been returned to the lessor. BBAM, which began as Babcock & Brown Aircraft Management remains the largest lessor for SpiceJet, with five aircraft – VT SGG/SGH/SGV & SGQ – all four Boeing 737-800s, and VT-SPU – a Boeing 737-900. All five BBAM aircraft are still operating flights for the airline. SpiceJet today flies an active fleet of 17 Boeing 737s, which includes only one 737-900 leased from BBAM. The other lessors are Air Lease Corporation (ALC), Ansett Worldwide Aviation Services (AWAS), Bank of China Aviation (BOC), Industrial and Commercial Bank of China (ICBC), and Mitsubishi Corporation Aviation Partners (MCAP). SpiceJet owns all its fifteen Bombardier Q400s. GE Capital Aviation Services (GECAS), another prominent lessor, had towards the end 2014 pulled out its five Boeing 737s, four of which are parked at Seletar Airport, Singapore- VT-SZE/F/G/H, all of which have been de-registered. It is believed that some of the 737s to come will be wet leased. Bangalore based Air Pegasus today received its first aircraft – an ATR 72-500, MSN 699 – from its lessor, after successfully completing its acceptance flight. Minor glitches in the aircraft’s auto flight system had delayed the ferry. The aircraft, sporting an all white body (much like Vistara’s first Airbus A320), was ferried from its storage at Kuala Lumpur, and flown to Bangalore via Dhaka, where it had a tech stop. The aircraft departed Kuala Lumpur at around 0340Z/0910IST, and landed at Dhaka at 1020Z/1550IST, after flying for almost 6hrs40min. The aircraft departed almost an hour later at 1120Z/1650IST, and landed at Kempegowda International Airport (Bangalore) at 1530Z/2100IST, after 4hrs10minutes. 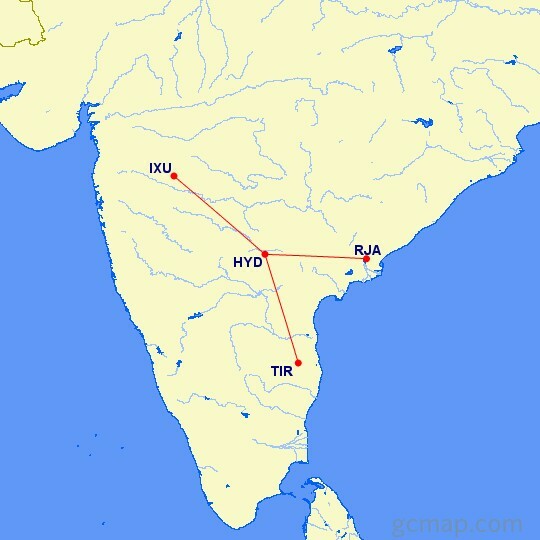 The first leg – Kuala Lumpur (WMKK), Malaysia to Dhaka (VGHS) was 1,550NM long, and the second leg- Dhaka(VGHA) to Bangalore (VOBL), India was 1,047NM long. Cruise was at flight level (FL) 240. Below is the routing. The aircraft was piloted by two captains- Sipsas and Brilakis – the only two expats on contract with Air Pegasus, as of today. The aircraft ferried flew in with a registration M-ABFC, and was formerly operating for Kingfisher Airlines with the registration VT-KAA. The aircraft went into storage in the April of 2012, and has not operated since. Air Pegasus becomes ATR’s newest operator in the country. Air Pegaus has been on a hiring spree, and may receive its AOP by end October, and start operations by early November. For more about the airline, you may read the interview of Shyson Thomas – MD & CEO, here. Since 2011, Air Pegasus has been in the news. The coverage has damaged the airline’s reputation- the managing director talked of starting operations twice, and both timelines were missed with not a single aircraft in India that was to operate under the Pegasus brand. The airline was granted its NOC late 2011, and since then renewed twice. Most, including the DGCA, haven’t taken Air Pegasus seriously. They’d written it off as another airline that will not take to the skies. But all that has changed. The MD and CEO of the airline, Mr. Shyson Thomas, firmly believes its his last renewal of the NOC, for he is confident of getting his AOP in September. This time around though, it’s for real. The airline will today (Monday, 4th August) sign on the dotted line a letter of intent with a lessor, who will supply the Bangalore based Air Pegasus Private Limited two eight-and-a-half year old ATR 72-500 aircraft. The airline has two expat pilots on its rolls, one of whom landed in Bangalore in the wee hours of Saturday morning from Athens, Greece, to attend an Aviation Security (AV-SEC) training. There are six Indian captains, and eleven first officers ready to fly the first two aircraft, and twenty all-female cabin crew ready to man it. For the first time in the history of the yet-to-become airline, lessors have reportedly been sending the airline emails, rather than the other way around. There seems to be confidence from overseas, from the likes of people who have burnt their fingers leasing aircraft to Paramount and Kingfisher. It is too early to see pictures of an ATR in the airline’s paint scheme, but once the signatures are done, two ex-Kingfisher/Deccan aircraft will be ready to start another chapter in the history of Indian aviation: an all ATR, pure-regional airline based out of Bangalore, to cater specifically to the south- a region attractive for it includes three Tier I cities and many promising, and economically important Tier II cities. Shyson Thomas speaks exclusively to The Flying Engineer, in his most detailed interview till date. With 102 questions, and answers, learn about the airline, and the aircraft-from his viewpoint, and about the man at the controls in this Interlysis with Shyson Thomas – Air Pegasus, Unplugged. CLICK HERE to dive into the depths of the airline.